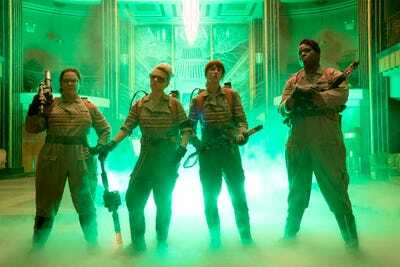 With new Ghostbusters to call on comes a new version of the iconic theme song. Swapping the ’80s pop and synthesiser tone of Ray Parker Jr.’s original, Fall Out Boy and Missy Elliott partnered to create a rock and hip-hop adaptation of the tune for Paul Feig’s upcoming all-female reboot. Parker’s original “Ghostbusters” theme was nominated for an Academy Award for Best Original Song and peaked at No. 1 on the Billboard Hot 100. Fall Out Boy and Missy Elliott’s song will be featured on the reboot’s soundtrack that also includes G-Eazy, Elle King, 5 Seconds of Summer, Zayn Malik, and more. Walk the Moon and Pentatonix also have songs titled “Ghostbusters” on the album. Elle King’s “Good Girls” is already available to listen to on her Vevo YouTube channel. “Ghostbusters” starring Melissa McCarthy, Kristen Wiig, Kate McKinnon, and Leslie Jones opens nationwide on July 15.